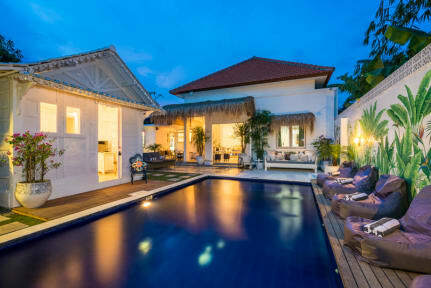 Gypsy Moon Bali is located in Canggu, 2.1 km from Echo Beach and has an outdoor swimming pool. The property is around 2.8 km from Vue Beach Club and 2.1 km from Batu Bolong Beach. Situated in the Batu Bolong district, the hostel is within 2.4 km of Berawa Beach. The rooms at the hostel come with a seating area. The rooms include a private bathroom. 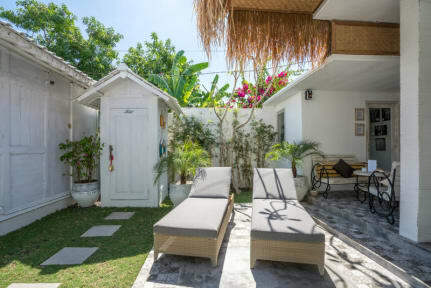 The units at Gypsy Moon Bali feature air conditioning and a wardrobe. The nearest airport is Ngurah Rai International Airport, 12 km from the accommodation. Very relaxed island atmosphere here at Gypsymoon. No daytime pool partying like at some of the surf hostels. The staff and facilities were incredible. Rooms cleaned daily and the complimentary breakfast was great. Daily scooter rental was helpful to zip down to the beach or shops/restaurants in other areas. Would highly recommend if seeking a laid back place to catch sun by the pool and relax. One of the best hostels I’ve ever stayed in. Very clean and modern, great WiFi, free breakfast and the staff are so so friendly! Good location in Canggu. We stayed here and then moved on but came back as we loved it so much! This hostel is by far my favourite I’ve ever stayed in, literally anywhere in the world! We had the private suite which is amazing, immaculately clean & has everything you could need, even little extras! The bed is huge & extremely comfy! We loved the pool! The town & beach are easily assessable even on foot! Lots of amazing cafes nearby! Overall the hostel was very relaxed, almost felt like a private villa with a few other people around! It feels like home instantly & we didn’t want to leave! Gypsymoon was outstanding, by far the nicest hostel I’ve stayed in the rooms feel nice, bright, modern and always cleaned. The lounging area is lovely with spots in the shade or sun.. really chilled out type of hostel so if you like a party atmosphere maybe its not the one for you but if you just want to relax gypsymoon is the place! Rented mopeds from the hostel something was wrong with mine and they replaced it straight away the hotel staff are so friendly and helpful. Thank you gypsymoon! A beautiful hostel with friendly and welcoming staff. I have stayed twice at Gypsy Moon and I have no complaints. Gypsy moon was fantastic! The staff were really helpful, the decor was beautiful and I truly enjoyed my stay here. It was quiet in the day and at night but there were plenty of lovely people in the hostel to socialise with. AOnly downside was the showers which were either freezing or scalding!